A refreshing blend of apples, strawberries, and fresh, juicy peaches. 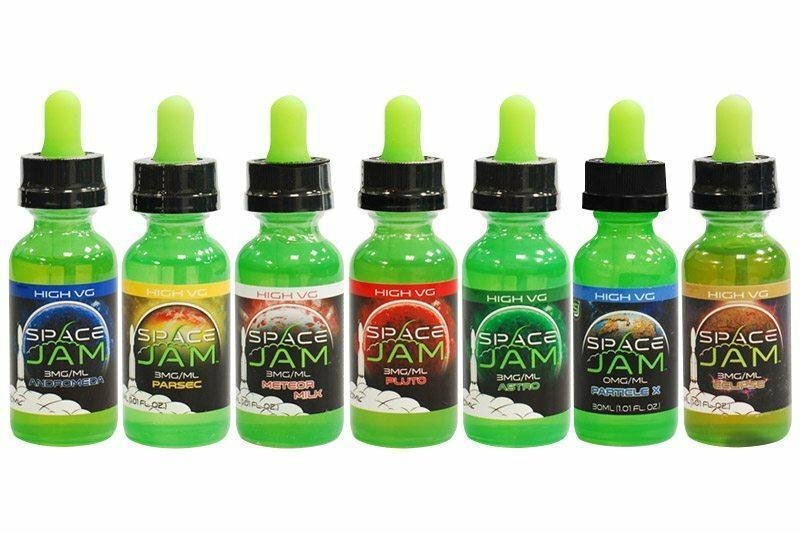 Finally, Space Jam has taken their juice making expertise and crafted an incredible tobacco vape. Smooth, creamy, sophisticated, and delicious, Eclipse blends a cavendish tobacco with vanilla notes that will make your taste buds dance. The Space Jam Robo Fuel juice that started it all. Andromeda is a smooth, creamy blend with pomegranate and blueberry, that will leave your taste buds craving more. Pluto starts off with a refreshing, clean melon, tops it with bubblegum goodness, then finishes with a hint of cooling mint. Fresh-from-the-oven, perfect blueberry muffin, just like the ones from your favorite doughnut shop. Space Jam’s unique take on the popular creamy strawberry profile, Meteor Milk is the perfect sundae blend of strawberry ice cream, strawberry syrup, and fresh strawberry topping. It will take your taste buds to meteoric heights! Pulsar, formerly known as Solstice, was originally Space Jam’s 2015 summer seasonal flavor, but has become a permanent flavor due to popular demand. It features a smoother, higher VG blend, and perhaps the most refreshing, invigorating eliquid flavor profile to date with its fusion of sweet, ripe wild cherries and freshly squeezed limes. They blend together into a perfectly crisp cherry limeade. This e-liquid blends sweet, tart lemonade with ripe, juicy peaches for a delightfully refreshing experience. Apple, kiwi, and orange blended together in a creamy, refreshing, sun-kissed smoothie. Straight-from-the-state-fair spun sugar, flavored with sweet blueberry and tangy raspberry.